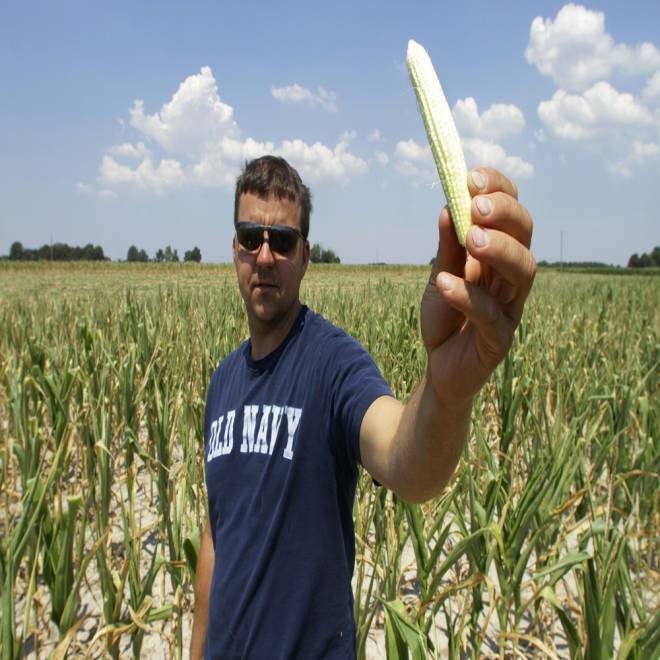 Steve Niedbalski shows his drought and heat stricken corn in Nashville, Ill. Farmers in parts of the Midwest are dealing with the worst drought in nearly 25 years. Shoppers across the country should stand up and take notice of the Midwestern drought that has already hurt supplies of corn and soybeans. The drought will lead to higher supermarket prices for everything from milk to meat. How high will depend on what happens with rain and high temperatures in the Corn Belt in the next few weeks. “We’re at the cusp of seeing how severely this is going to impact consumer prices,” said Darrel Good, professor emeritus of agricultural and consumer economics at the University of Illinois at Urbana-Champaign. In a twist that may sound counterintuitive, prices in the next few weeks for certain products may end up being major deals as a result of the drought. For example, you may want to make room in your freezer for meat because prices for beef and pork are expected to drop in the next few months as farmers slaughter herds to deal with the high cost of grains that are used as livestock feed, said Shawn Hackett of the agricultural commodities firm Hackett Financial Advisors in Boynton Beach, Fla. But, he added, everything from milk to salad dressing is going to cost more in the near term, and eventually the meat deals will evaporate as demand outstrips supply. Agriculture experts and economists largely agree that the weather conditions are expected to hurt corn crops, and in turn will impact retail prices in the weeks ahead. But we won’t know the full impact of the drought until early August or September, said Richard Volpe, research economist for the Economic Research Service of the U.S. Department of Agriculture. Rain is in short supply across most of the country and you could be paying the price for it at the grocery store. NBC's Janet Shamlian reports. “We don’t yet know what’s going to happen and we don’t yet know how severe the drought will be and the amount we end up getting at the end of the corn harvest,” he stressed. The USDA provides monthly estimates of food prices but the June data showing increases of less than 5 percent for key items such as dairy and meat products does not take the recent grain issues into account. Updated figures on the drought’s impact will be released July 25. Field corn, also known as feed corn -- which is different from the sweet corn many of us eat during our barbecues -- is in about 74 percent of the foods consumers buy in supermarkets, he pointed out. This year, corn supplies were expected to be more than ample because many growers in the Corn Belt -- including Illinois, Indiana, Iowa, Nebraska and Minnesota -- increased acreage of the crop to meet growing global demand, said John Riley, assistant extension professor at Mississippi State University. “But it will now fall short because of the drought and heat,” he noted. The price for a bushel of corn hit $7.48 a bushel at the Chicago Board of Trade this week, and government figures now project this year and next that a bushel will be as much as $6.40 a bushel, up significantly from last month's projections of $4.20 to $5 a bushel. The expected rise in food prices is nothing new for consumers. “Food price inflation in 2011 was well above normal,” explained Corinne Alexander, an agricultural economist at Purdue University. Grocery store food inflation was 4.8 percent last year, she said, and the expectations were of about 2 percent this year. “The drought means above normal food price inflation in 2012, and going into 2013,” he noted. While prices for processed foods such as cereal are not expected to rise considerably unless the shortages get much worse because producers had already instituted huge price hike last year, she continued. But, she added, the cost of things like oil and salad dressing are likely to rise because soybean crops have also been impacted. The food-price roller coaster is a scary ride consumers have been on for some time. There have been tight supplies going back to 2006, said Mississippi State’s Riley. “Weather events and a bump up in demand for corn for renewable fuel,” he explained, have all contributed to the problem. A look at how soaring corn price could impact your grocery bill, with CNBC's Jackie DeAngelis.